Nowadays, feathered dinos are all the rage. Since 1999, over 20 new species have been discovered, ranging from sparrow-sized tree-climbers to thirty-foot tyrannosaurs. 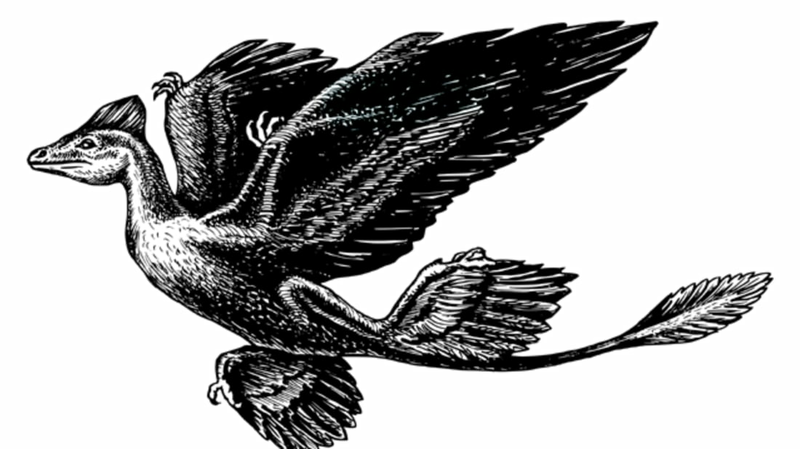 Among these bird-like beasts, few can match the intrigue of Microraptor, a pint-sized predator from prehistoric China. 1. It Had Four Wings. Microraptor had long, powerful feathers anchored onto its arms, but the critter’s hind limbs are where things really start to get unusual. Amazingly, both legs boast wings of their own as well. What did it do with this second pair? Stay tuned for a few suggestions. Dromaeosaurids (informally called “raptors,” thanks to Jurassic Park) were a group of advanced carnivorous dinosaurs best known for their infamous sickle-shaped toe claws. Some primitive species, like the recently-unearthed Changyuraptor, shared Microraptor’s weird attributes. 3. Microraptor Occasionally Gobbled Up Fish. 4. Microraptor Shared its Skies with Flying Reptiles and Early Birds. 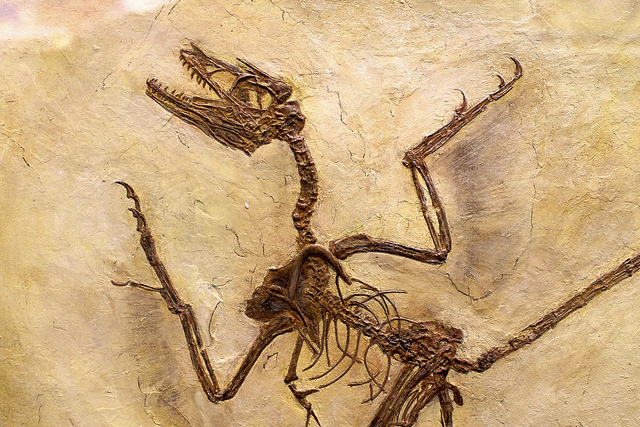 Essentially modern-looking birds had already evolved by the time Microraptor showed up 120 million years ago, and avian bones have even been found inside one specimen’s gut. 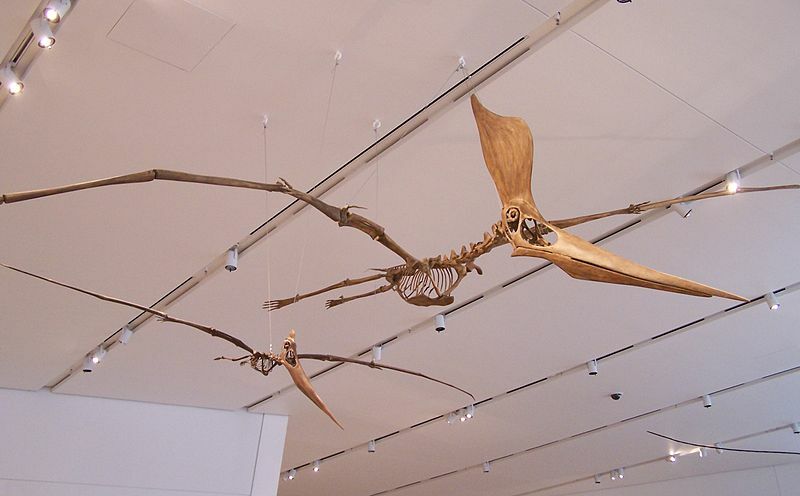 Also flapping overhead were various pterosaurs—magnificent winged reptiles which took flight throughout the age of dinosaurs. 5. It Had Some Contentious Hips. Did Microraptor, like most dinos, hold its rear legs directly underneath its body? Or did they splay out to its sides crocodile-style while airborne? Trivial as these questions might sound, they have huge implications for understanding how this dinosaur got from place to place. Scientists disagree about which interpretation is correct, but its hips and upper legs doubtlessly hold the key. Unfortunately, Microraptor’s delicate bones complicate the situation. These usually get crushed during fossilization, distorting their shape significantly. 6. 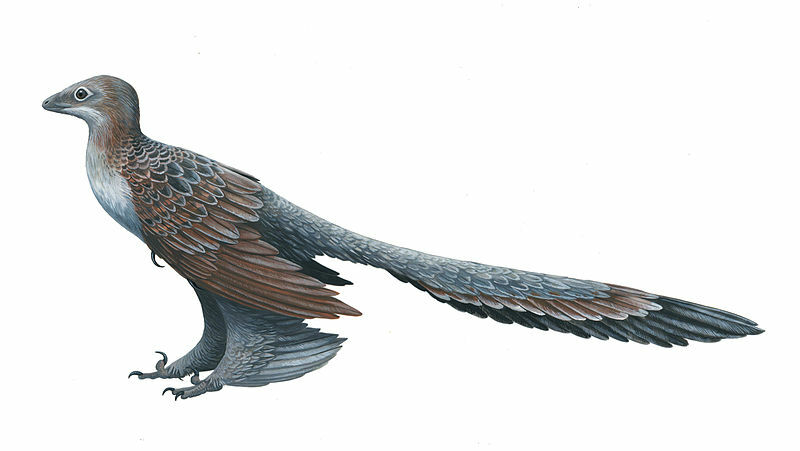 Microraptor Might Have Resembled a Feathery Biplane. According to one hypothesis, Microraptor stabilized itself by holding its leg-wings beneath and parallel to those on its forelimbs, like a WWI fighter plane. The Red Baron would have approved. 7. It Had a Glossy Coat. Color-producing organelles called “melanosomes” have been found inside fossilized Microraptor feathers. Close examination of their arrangement reveals that the dinosaur’s plumage was, in life, quite dark and somewhat iridescent. 8. Microraptor is Delightfully Well-Represented. 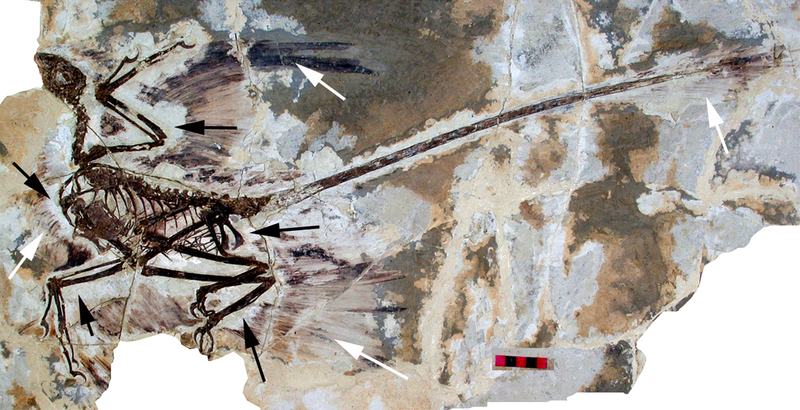 Most dinos are known only from a handful of skeletons or partial remains, but several hundred known Microraptor specimens have emerged over the past two decades, allowing paleontologists to extensively compare and contrast individual animals. 9. It’s Been Subjected to Wind Tunnel Experiments. Naish and company also argue that although excessive drag would have prevented Microraptor from flying efficiently, it could glide reasonably well. 10. 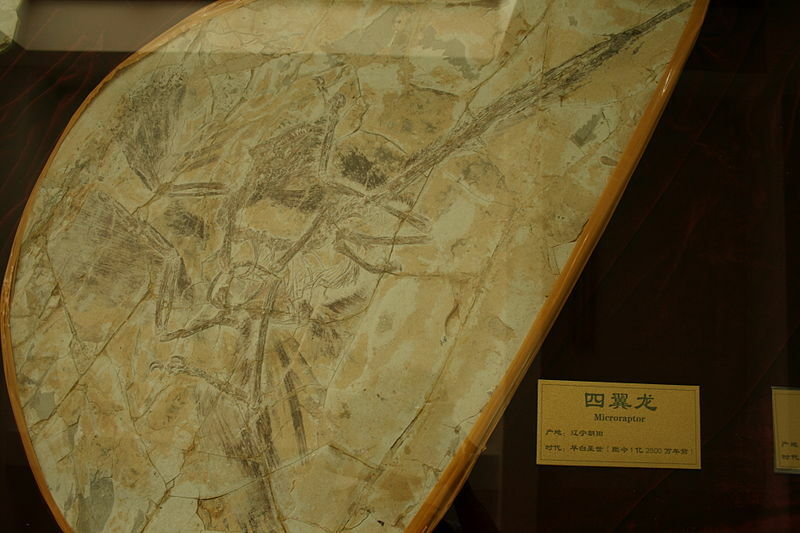 One Scientist Predicted the Discovery of a Microraptor-Like Animal 85 Years in Advance. In 1915, naturalist William Beebe hypothesized that, at some point during the evolution of avians, four-winged animals were produced. 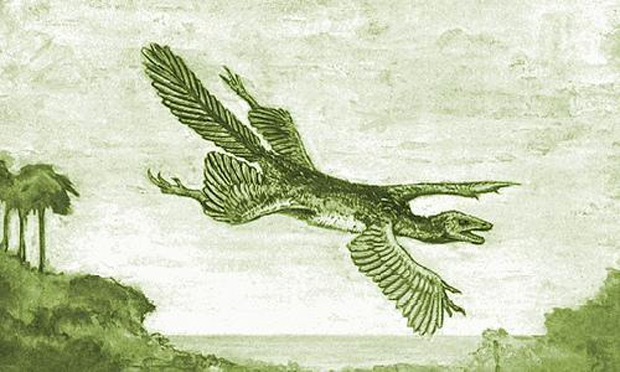 Though Microraptor’s exact placement within the dinosaur-bird transition remains hotly debated, its existence lends credence to Beebe’s prescient hunch.